SUV Shopping? 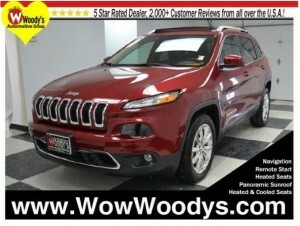 Check out this Brand NEW 2014 Jeep Cherokee Limited for sale in the Greater Kansas City area! Jeep has been setting the standard for more than 70 years! The dominance continues with this 2014 Jeep Cherokee Limitd FWD 3.2L V6 Sunroof, Leather & Heated /Cooled Seats, Uconnect 8.4AN SXM/HD/BT/Navigation, Uconnect Access, Alloy Wheels, Remote Start, Parallel/Perpendicular Park Assist w/Stop, ParkView(TM) Rear Back-up Camera, Blind Spot and Cross Path Detection, Forward Collision Mitigation, Lane Departure Warning Plus, Power Adjustable Driver’s Seat w/Memory Position Settings, Power Liftgate, Bluetooth Streaming Audio, Uconnect Voice Command w/Bluetooth. We will pick you up at the airport or ship your vehicle to you! If you’d like more information about this luxurious NEW Jeep Cherokee our huge selection of other new Jeep or 700+ vehicles located near Kansas City please visit our website and provide us with your contact information. One of our empowered Woody’s Automotive Group Sales Advisors will contact you promptly. For immediate assistance contact us toll free today at 888-869-0963. Our award winning Finance Management Team works with over 15 local and national banks to get you the best rate and term. When it comes to Price, we’re third party verified among the lowest in the nation! This vehicle is certified with a Pre-Owned Warranty at no cost to you! Not sure which vehicle you want? With the largest, most diverse inventory in Middle America you can view all makes in one location! The majority of our vehicles qualify for Woody’s Assurance Program that includes a 12 Month Return Policy, Limitations Apply, see dealer for details.